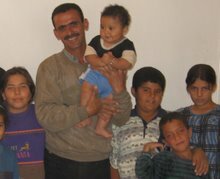 Thaer fled Baghdad, Iraq in October 2005 with 17 other Palestinian refugees (seven children, four women, seven men). They fled because Palestinian refugees in Iraq were increasingly targeted by Iraqi militias. Some of their friends and family members had been tortured and killed. Members of the international peace and human rights group Christian Peacemaker Teams (CPT) and the Iraqi group Muslim Peacemaker Teams (MPT) accompanied them on the journey from Baghdad and stayed with them on the Iraq/Syria border for two weeks. Tom Fox, who was later kidnapped and killed in Iraq, was among the CPT members on the journey. 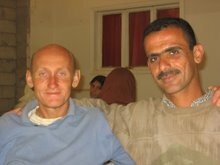 Tom became the primary contact with a Canadian who read about the refugees' plight and became their immigration sponsor. 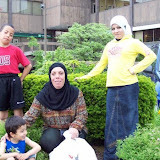 Sheila Provencher of CPT, who also accompanied the refugees, and later became Thaer's fiancee, stayed in touch with them and helped the sponsor to continue their Canadian immigration applications after Tom's death. The group of 18 refugees was eventually accepted by Syria into the Al Hol Refugee Camp, run by the United Nations High Commission for Refugees (UNHCR). They have resided in the Al Hol camp since November 2005. They can obtain permission to leave the camp to go to Al Hasseke, Damascus, or other cities. Thaer was officially a “protected person” under UNHCR’s mandate. Thaer, as part of the group of 18 refugees, has an active application for immigration to Canada. Thaer also began a fiance visa application to the U.S. but has had great difficulty because of his deportation back to Iraq. 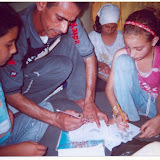 The First Detention: Thaer was detained on or around Dec 22, 2006. He was taken from the town of Al Aol, next to the refugee camp. CPT member Sheila Provencher, Thaer’s fiancée, learned of his detention on Dec 29, 2006. 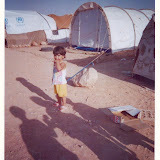 She alerted the Canadian sponsor and they received confirmation from UNHCR Damascus. Syrian officials refused to report the charges against Thaer to the UNHCR or any other organization, despite repeated requests. They also refused access of family, human rights groups, or legal counsel. Thaer was initially held at the Qamishley Military Security Prison. However, sometime between the visit and January 5, he was moved from Qamishley Prison to Damascus. He was then transferred to the Palestine Branch Military Intelligence facility in Damascus and held incommunicado for five weeks. Human rights groups have documented widespread use of torture at this facility. Thaer was tortured here by being beaten severely on the soles of his feet. He was also held under ice-cold water until he felt he was drowning. He was kept in a small cell with very little food or water. His interrogators asked him about his contact with Americans, insisted that he was NOT engaged to an American, and insisted that he was working for the U.S.
On Janury 30 or 31, Thaer was transferred to the detention facility for the Immigration and Nationality Department, in the Ministry of the Interior. As of February 3, UNHCR confirmed that he was at high risk of deportation to Iraq. Deportation to Iraq places Thaer in danger of further detention and possible torture and death, particularly because he is associated with human rights activities on behalf of Palestinian refugees. Deported: On 10 February Thaer was deported to the Iraq/Syria border. 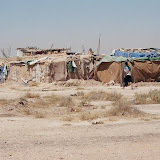 He stayed in the no-man's-land area, called the Al Tanf camp, where approximately 350 Palestinian refugees from Iraq are living in tents. He remained in hiding for one month in the Al Tanf camp. UNHCR knew of his location and hoped that Canadian immigration officials would receive permission to have access to him there. Unfortunately, this did not happen. The Second Detention: On 10 March 2007 Thaer was discovered in the Al Tanf camp by Syrian security. Syrian security forces arrested him and took him back to Far Filistin, the Palestine Branch Military Intelligence prison in Damascus. Syrian authorties refused any organization or individual seeking access to Thaer and would not release information about his condition. 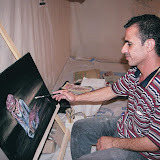 UNHCR worked on Thaer's case but was pessimistic about his chances. On 4 April Thaer was transferred from Far' Filistin prison and sent to a detention center to await deportation back to Iraq. UNHCR tried and failed to block the deportation. On 5 April Thaer was deported to Iraq and handed over to Iraqi border authorities. After almost one week in detention on the border, Thaer was released and is now in the Al Walid refugee camp. He joins about 800 Palestinian refugees who have fled threats of torture and death in Baghdad. 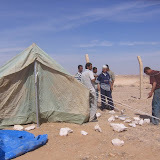 They live in tents in harsh desert conditions, with no ability to cross borders to a safe place. Although Thaer and his American fiancee have nearly completed his visa application, Thaer now has no access to U.S. immigration. U.S. policy currently requires visa applicants from Iraq to leave Iraq and apply for visas at U.S. embassies elsewhere. But Palestinians in Iraq have no travel documents and cannot leave! 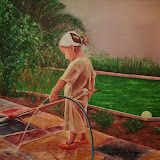 Thaer is trapped in Iraq. (as of May 2007).